Sean McMillan, CEO & Head Designer at Spirit Yachts, talks us through some of the highlights of the Spirit racing yacht 52D. The concept of the Modern Classic has been embraced by us at Spirit Yachts for over twenty years and is expressed through some 66 Spirit yachts afloat worldwide. However, perhaps none of these Spirits more perfectly conveys the idea of the Modern Classic in quite the same way as the new Spirit 52D just launched! There is a glorious moment in the build of any wooden yacht when the finished hull is rolled over but the interior is not yet fitted. At this stage, the purity of the core structure of the boat is seen for the first, but regrettably the last time, as the interior starts to break up the space. 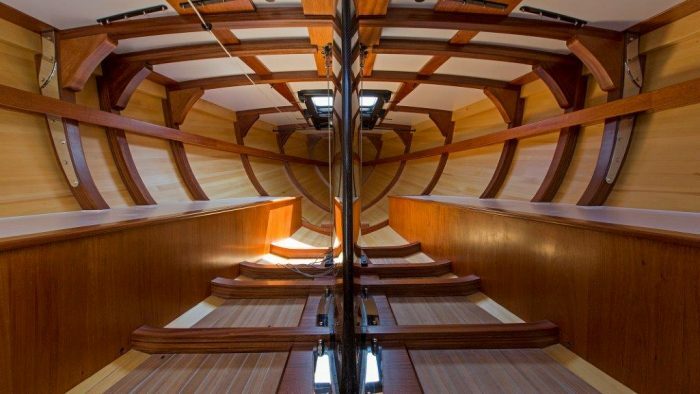 I have thought more times than I can remember that it would be wonderful to build a yacht with no interior so the beauty of the hull can be appreciated and celebrated in its own right. You can imagine our enthusiasm when we were commissioned by an internationally known and highly respected racing yachtsman to build a Spirit 52 as a totally maxed-out race boat – without carrying the weight of any interior! The design harks back in many ways to the glory days of the ‘metre boats’ of the 1930s with flush decks, slim easily driven lines and supremely elegant overhangs. However, in the true spirit of a Modern Classic this yacht is as tricked-out for racing as can possibly be. Of course, there is the Spirit standard carbon rig (although in ultra-high modulus for this yacht), but so much else has been engineered in carbon as well, from the keel blade and rudder to the winches, and the host of fittings, large and small, that would normally be in stainless steel; all done with the aim to keep the weight to a minimum. Oui Fling will debut in July at the BCYC Panerai British Classic Week, the UK’s premier classic yacht regatta in Cowes, beginning a racing season culminating with Les Voiles De Saint Tropez in October. At the BCYC Panerai British Classic Week, she will be racing against a mixed fleet of classics, but also against five or six other Spirits, including my own Flight of Ufford – also a Spirit 52. However, whilst they may be the same length and essentially share the same hull, Oui Fling is some 1,500 kilogrammes lighter so I suspect I may spend much of the regatta admiring her very elegant transom!! Please contact Spirit Yachts via [email protected] for further details.